That feeling you get when you make something so simple yet it turns out so delicious? PURE JOY. That is what these raw walnut fudge brownies bring me. No-bake, vegan, paleo-friendly and oh-so-delicious. I mean we’re talking basically four ingredients for the brownie base (five if you count water) and five ingredients for the frosting. And while you may be thinking, “Do I really need the frosting?” I will reply with an astounding “YES. 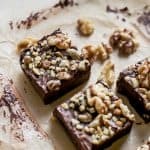 Yes, you do.” Because the frosting is what really gives these raw walnut brownies that true fudgy brownie feel – but without all the extra sugar and other nonsense you’d get from say, a store-bought bakery brownie. Speaking of, Drew bought a mini package of cheesecake brownies from the store the other week. I took a look at the nutrition label out of curiosity and WOWZA there was a lot going on in there. It was like reading a novel. Not that I let that stop me from trying a bite because I couldn’t deny myself trying a little piece. Balance and moderation, my friends. And of course it tasted good, I mean I’m not gonna lie. BUT it always amazes me just how many ingredients are in most grocery store bakery items like that. Just an ungodly amount. Thankfully there are healthier homemade versions out there and no-bake alternatives that are made with nutritious ingredients. 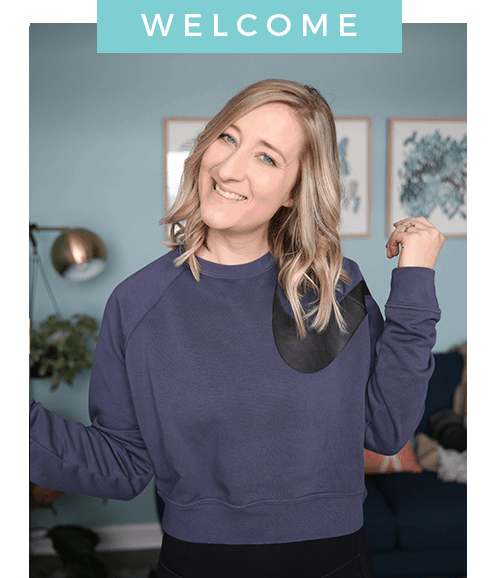 I first made these over on IG with nuts.com but they were just way too good not to give them a permanent home on the blog. 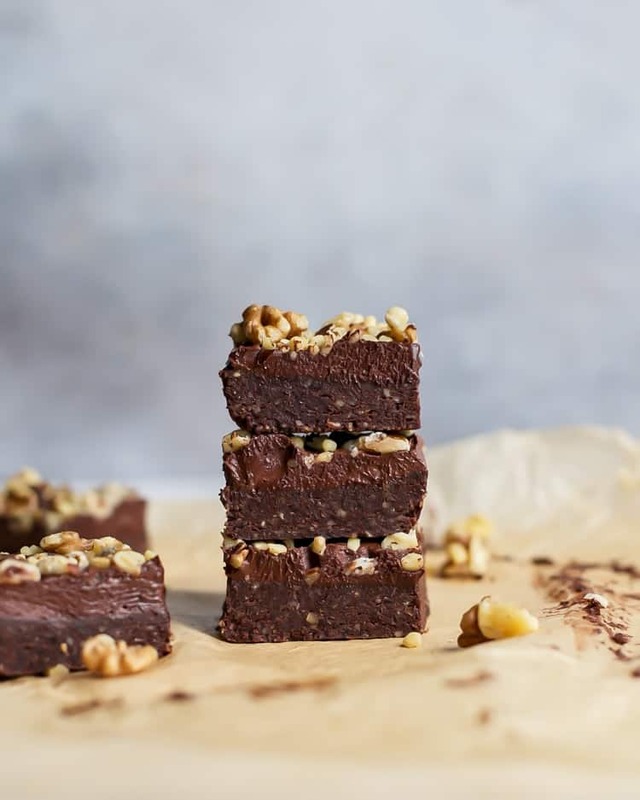 Like most “raw” brownies, these are simple and quick – you just need a food processor (I have/love this one) or high-powdered blender (such as the Vitamix). First blend together the walnuts, dates, and cacao powder. It will look fairly dry but as soon as you add the water everything comes together. The mixture should be somewhat sticky but not mushy, so just be careful not to over-process. Then the mixture gets pressed into a loaf pan – I made a slightly smaller batch of these walnut brownies (versus a 8×8 pan) because while the brownies are made with healthy ingredients, they are still pretty rich in taste… Meaning you may be satisfied with a smaller brownie instead of a big square. You can also easily double the recipe if serving a crowd. Pop the pan in the freezer while you make the frosting, which is made with powdered sugar, vegan butter or coconut oil (I used butter flavored coconut oil), a little milk and some vanilla. It’s best to use an electric mixer here to whip everything together so it gets smooth. You’ll also want to make sure the milk is room temperature so it doesn’t seize up the coconut oil. Then all that is left is spreading on the frosting and topping with walnuts! Super quick, super easy and super delicious. Just trust me when I say your summer NEEDS these. 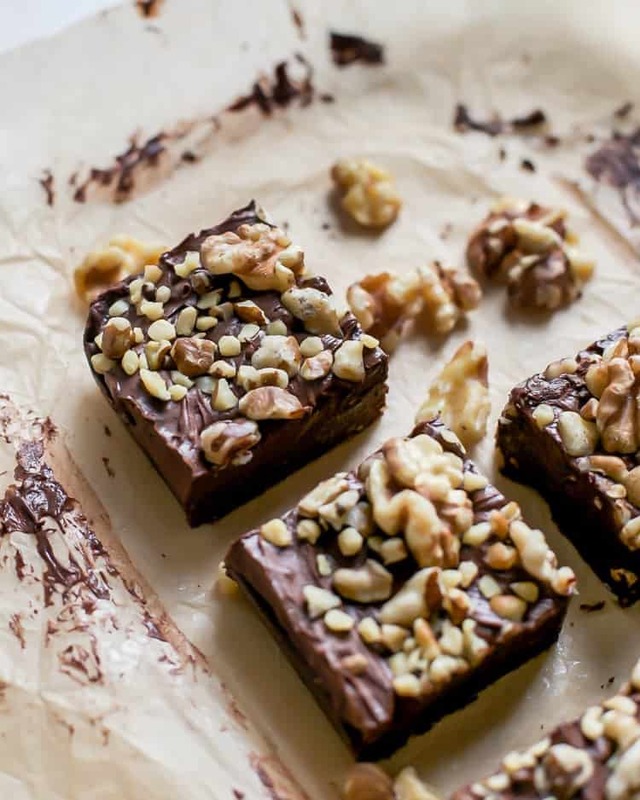 These Raw Walnut Brownies with Fudge Frosting couldn’t be easier. 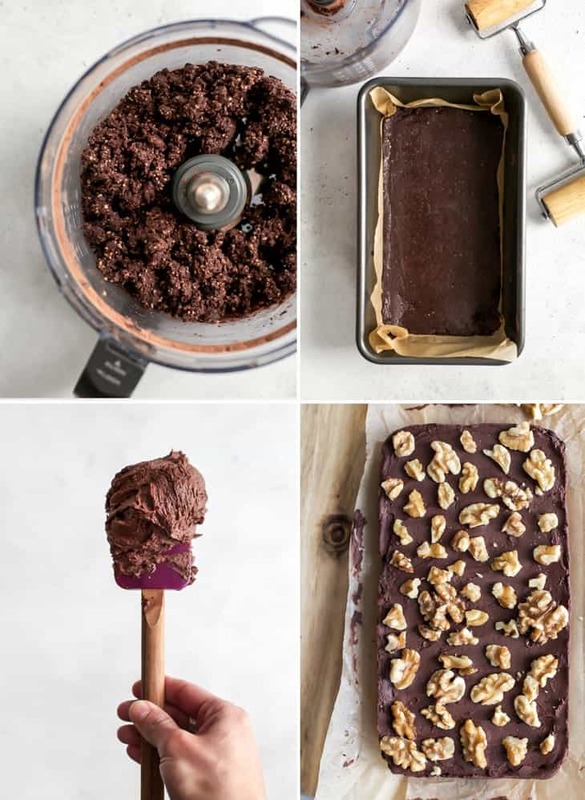 The perfect no-bake and healthy vegan treat, paleo-friendly too. Line loaf pan with parchment paper; set aside. 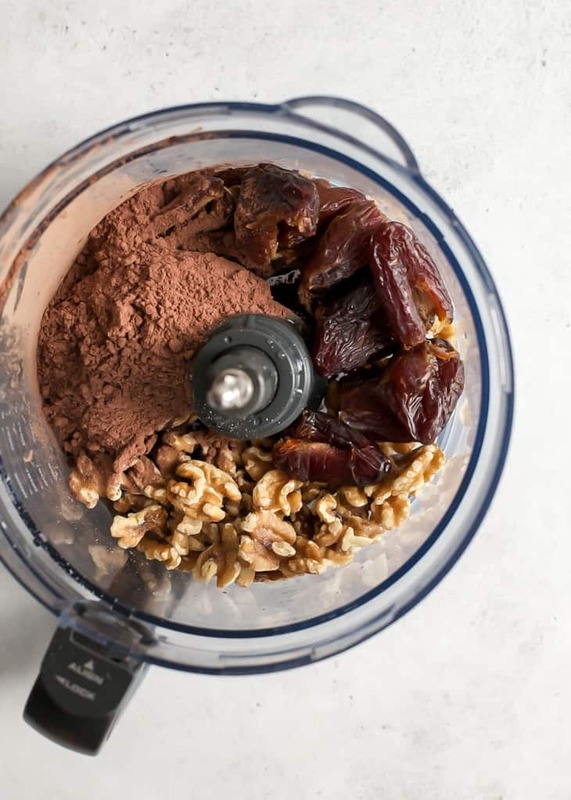 In food processor bowl combine walnuts, pitted dates and cacao powder until walnuts and dates have broken down, mixture may look a little dry. With the motor running add in vanilla extract and water one tablespoon at a time until mixture comes together. See pictures in post. Press mixture evenly into loaf pan (I love this pastry roller tool) and place in freezer for about 15 minutes. Meanwhile, make the frosting: use electric hand or stand mixer to combine powdered sugar with vegan butter, scraping down sides of bowl with spatula as needed. Add in milk, vanilla extract and cacao powder; beat again until thick and fluffy. Make sure to start on low speed then gradually increase speed. 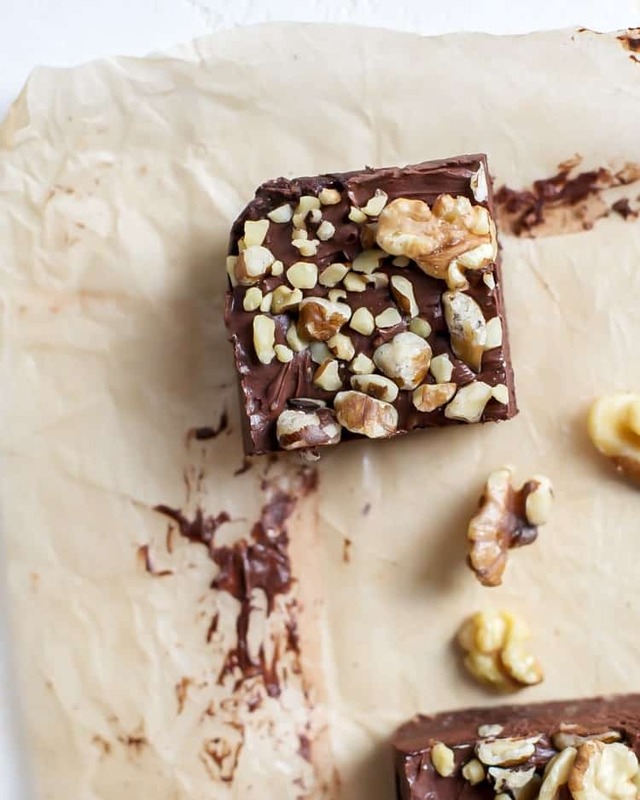 Remove pan from freezer and frost brownies, topping with chopped walnuts and garnishing with whole walnuts. Lift parchment paper from pan and place on cutting board to cut brownies into squares. Enjoy! Leftovers will keep in airtight container for about 1 week. 1 If not a fan of walnuts, I’d suggest using a mix of cashews and almond. 2 I tested the frosting with softened “butter” flavored coconut oil and the frosting whipped up to a good consistency. If using coconut oil, make sure it’s scoop-able soft, not liquid or hard/solid. These sound so good, I could whip up a batch right now!… if I had some dates laying around! 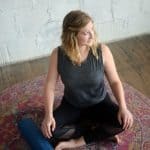 Are there any good alternatives to dates? I see so many vegan/raw treats using them but I don’t always keep them on hand. Oh man I am not sure there is a good alternative in this case – the dates keep them sweet and sticky/held together. I made the frosting with coconut oil and it didn’t “fluff up” like the vegan butter you used. It kind of stayed like a chocolate drizzle. Nonetheless I poured it over the brownies and popped it back in the freezer to firm up. Can’t wait to try them! Hope you were able to enjoy them still! I forgot to put in the recipe notes that I did test with a “butter flavored” coconut oil that was softened – not melted just scoop-able and soft. It worked okay! Could have varied results based on the consistency of the oil though. I made these today. They are incredibly delicious. Wow. Totally impressed. Now I want every recipe you have. Thank you. Thank you. Thank you!!? The frosting loaded on the spatula…OH MY LORD. I just want to stick my finger into the creamy glory and try it! The brownies themselves look incredibly delicious as well. I bet it would be such a big hit if I made it with my family!